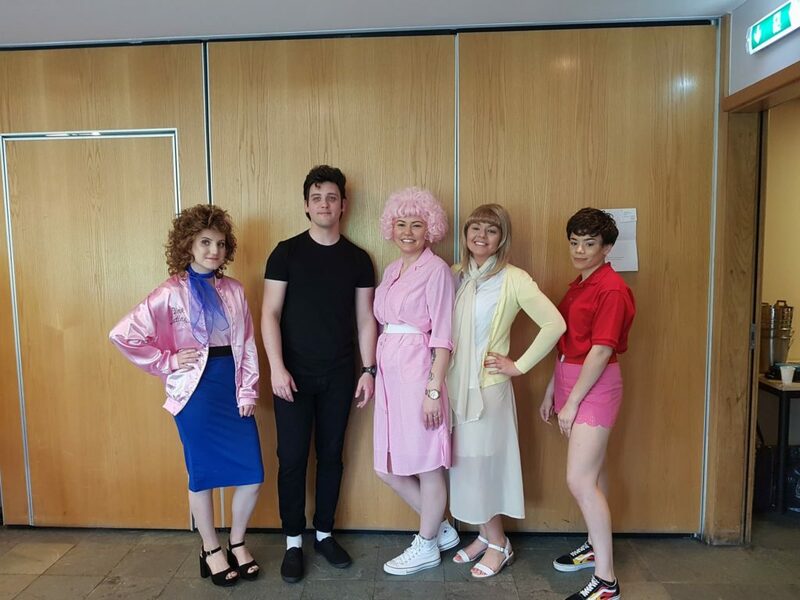 The Pink Hair Solutions team were delighted to take part in an event recently to raise money for Bishop Vesey’s Grammar School in Sutton Coldfield. 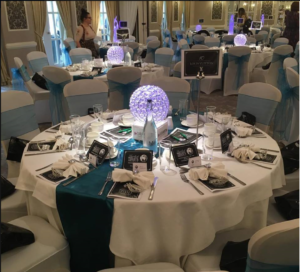 The Lunch at Tiffany’s Event, held at Moor Hall Hotel on Wednesday 6th March 2019, was a fun-filled day, which aimed to raise money for the school and showcase some great local products and services. We enjoyed a lovely drinks reception and a fantastic two-course lunch followed by a fashion show and musical entertainment. There was a range of market stalls to browse and a raffle, featuring some amazing prizes. We were also able to showcase our own range of products at the Pink Hair stall, and our team were on hand to answer questions. Overall, we thought the day was a huge success, we really enjoyed taking part and we’re sure it will have a positive impact on the school. 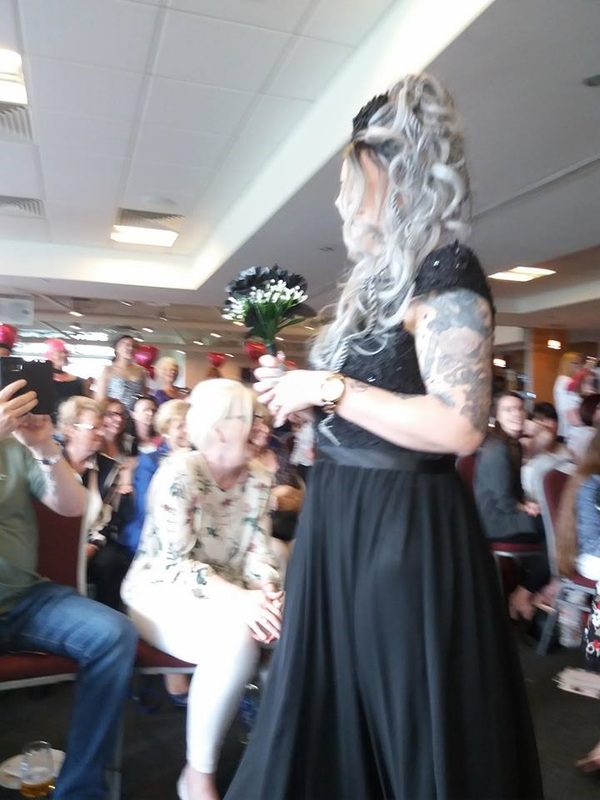 To find out more about Pink Hair Solutions and the services we offer please call us on 0121 350 3826 or follow us on Facebook to stay up to date with the latest events we are supporting. 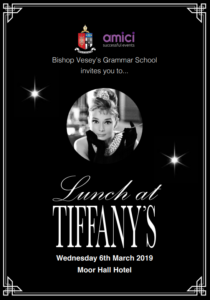 At Pink Hair Solutions we strive to help our local community, so to support Bishop Vesey Grammar School, will be having our very own stall at the fabulous event, Lunch at Tiffany’s. Funds raised for The Vesey Experience allow the school to maintain their standard of excellence, and you could contribute too by purchasing a ticket for this great day. The day is filled with exclusive stalls, high fashion and fine dining – you could get your ticket for just £40.00 per person! 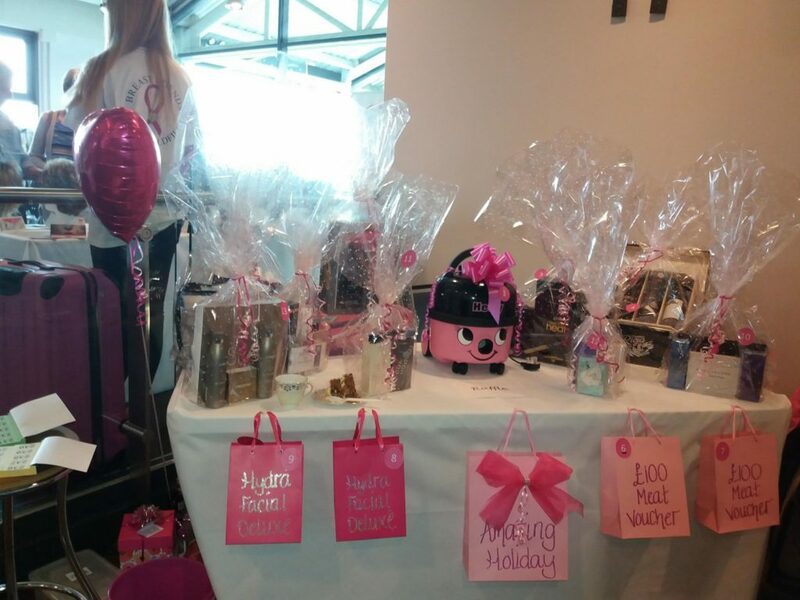 Our stall will showcase a wide variety of products available at Pink with team members on hand throughout the event. Please click here to download the event flyer and find out more information. 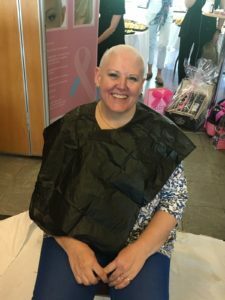 At Pink Hair Solutions we always try our best to help out charities in need. Therefore, to celebrate our 30th anniversary we are supporting The Little Princess Charity Ball 2019. 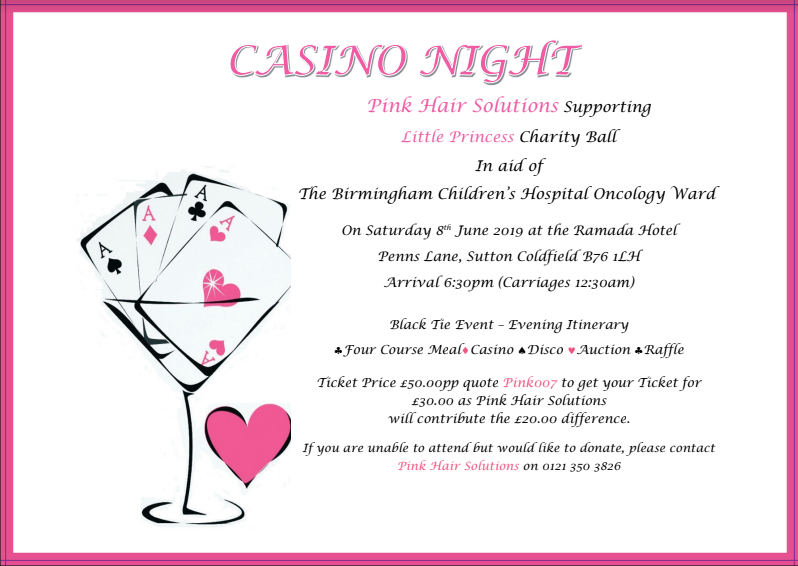 The ball is being hosted to raise money for The Birmingham Children’s Hospital Oncology Ward. The Oncology Ward features a team who are dedicated to treating children and young people with cancer. During the Little Princess Ball Casino Night, each ticket holder will receive a four course meal, followed by a disco to dance the night away. This is sure to be a night to celebrate in style with a black-tie dress code. Throughout the event there will be opportunities to donate, with hosted auctions and prize raffles, as well as casino games all around for everyone to get involved in. Ticket prices for the ball are £50 per person, but the first 100 people to quote Pink007 will receive a ticket for just £30 per person. The £20 difference will then be donated by Pink Hair Solutions. It would be great to see all our Pink family and friends celebrating with us at this spectacular event, for such a worthy cause. Alternatively, if you are unable to attend The Little Princess Charity Ball but would still like to make a donation, please contact a member of our team on 0121 350 3826. 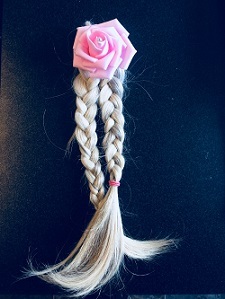 At Pink Hair Solutions we aid women with all types of hair loss by providing wigs and hair pieces to those looking to rediscover their identity and self-confidence. We support our customers throughout their journey by providing a comfortable environment with a well-trained, supportive team. To find out more about our services please click here or get in touch with our team. 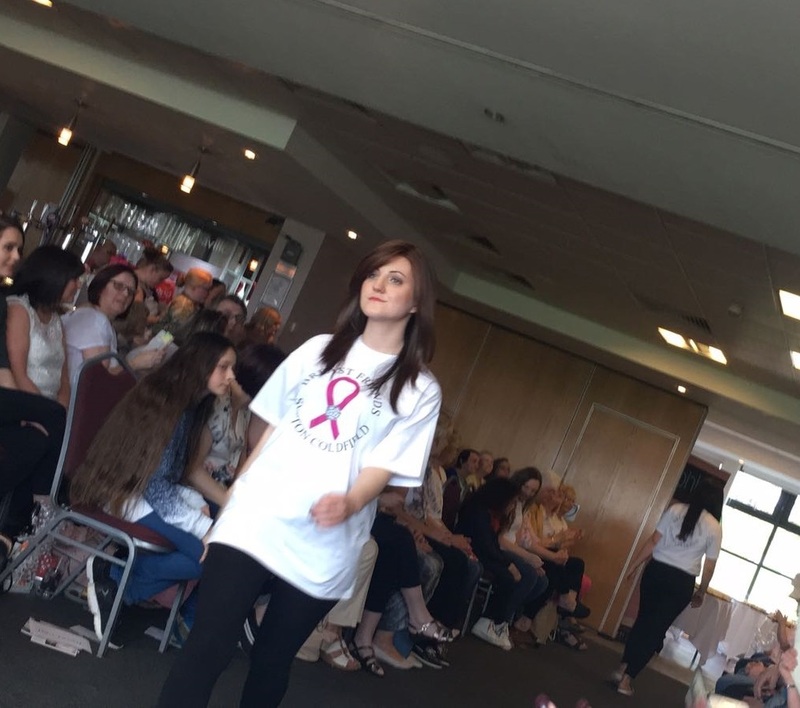 Over the weekend, our Pink Ladies have been out and about raising money for Breast Friends. 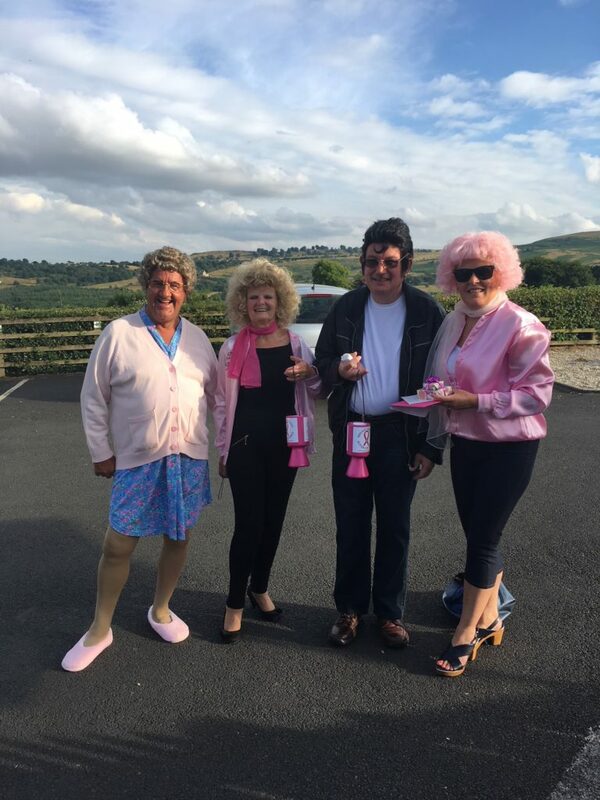 Wearing their best fancy dress costumes – including Mrs Brown, and characters from Grease, the Pink team rallied support to encourage people to dress up and donate to this fantastic charity. Breast Friends is a volunteer run charity that supports women with cancer through diagnosis, treatment and beyond. 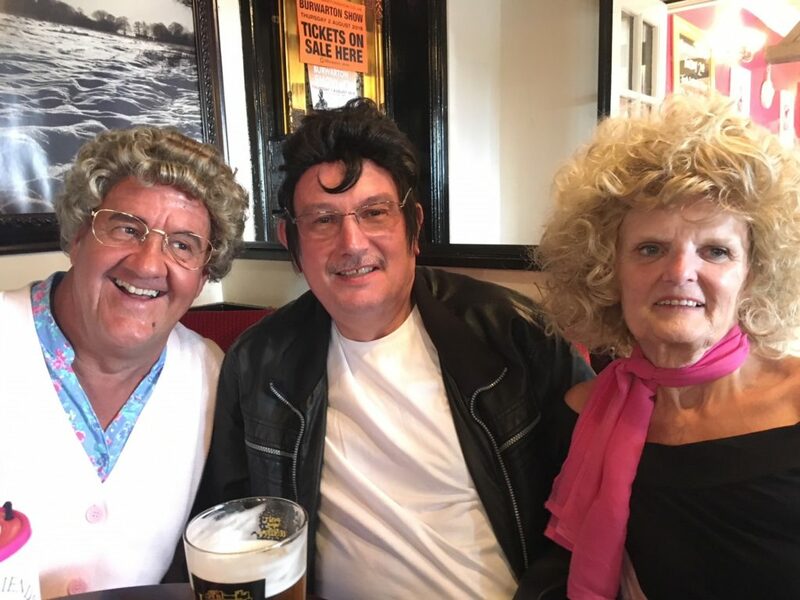 At a charity event, held at the Three Horseshoes Pub in Wheathill, Bridgnorth, a competition for the best dressed individual helped in raising money, as all those who took part donated £5.00 per entry. We received many entries and lots of donations – all of which are currently being checked and counted by the charity so we can announce the total raised at a later date. We’d like to say a big thank you to the owners of the Three Horseshoes, Jim and Jane, who were very welcoming and put on a really good night with a singer and spread. Everyone who participated looked fantastic and played a huge role in filling our two Breast Friends money tins! Please do revisit our blog soon or check out our Facebook page where we will announce the total amount raised. 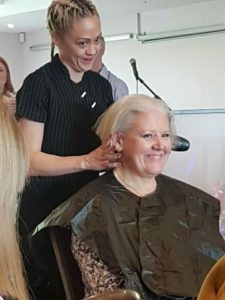 On the 22nd April 2018, Pink Hair hosted a Charity Hair Show to Raise money for Breast Friends Sutton Coldfield and can proudly announce a breath taking £10,164.00 was raised. Firstly we would like to say a massive Thank You to the Pavilions at Moor Lane for letting us use the venue free of charge, and for all their help while planning our event over the past few months. Thank you to all the ladies, gentlemen and children that joined us for a fun filled afternoon and helped us raise such an amazing amount of money. 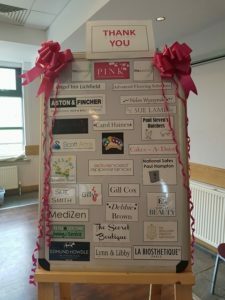 Before our event took place the fundraising had already started, the following people made such an impact on the full amount raised for Breast friends. 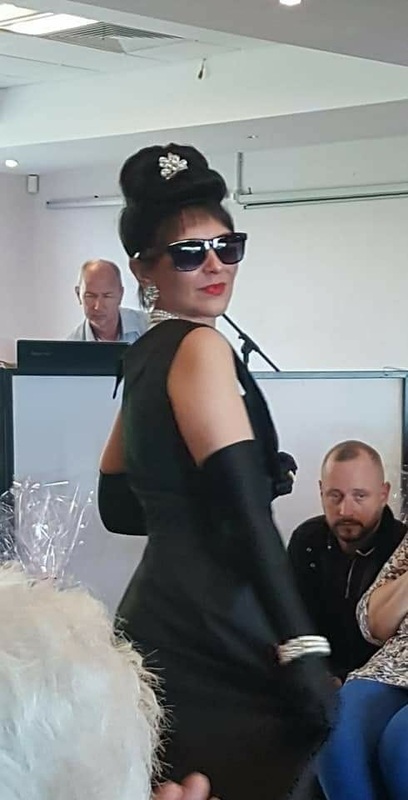 We kick started the event with champagne and food, this gave our guest’s time to browse around many of our market stalls including: Bernie the Dress Maker, Tropic, Forever living, Hip Headwear, Bannatyne Spa, Avon, Sheer success, Foxy Lady, Amoena, Jewellery stall and Cards. This was also a chance for our guests to try their luck on the tombola and to buy raffle tickets which included some fantastic prizes which we all kindly donated. 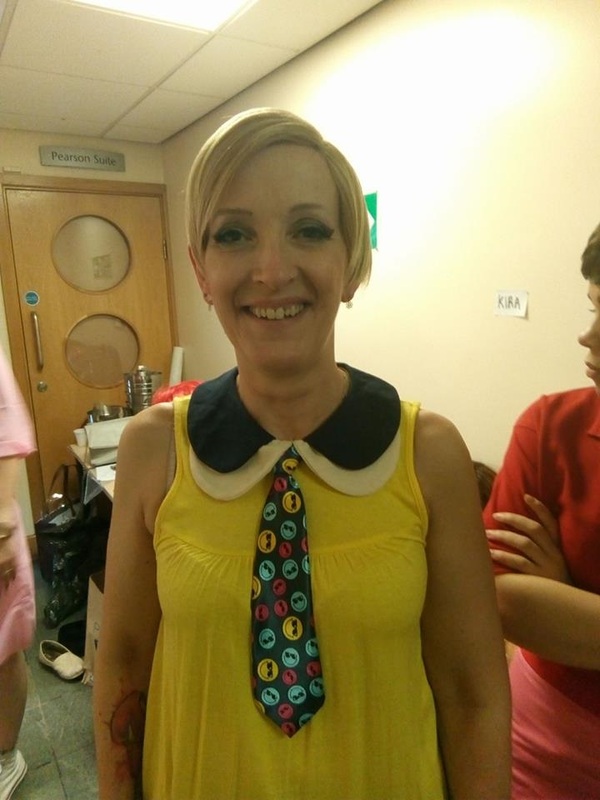 We started our Hair show, with a bit of fun working our way through the decades from the 1960’s up to the 2000’s – we’ve included a couple of images here but please visit our Facebook page for more pictures. 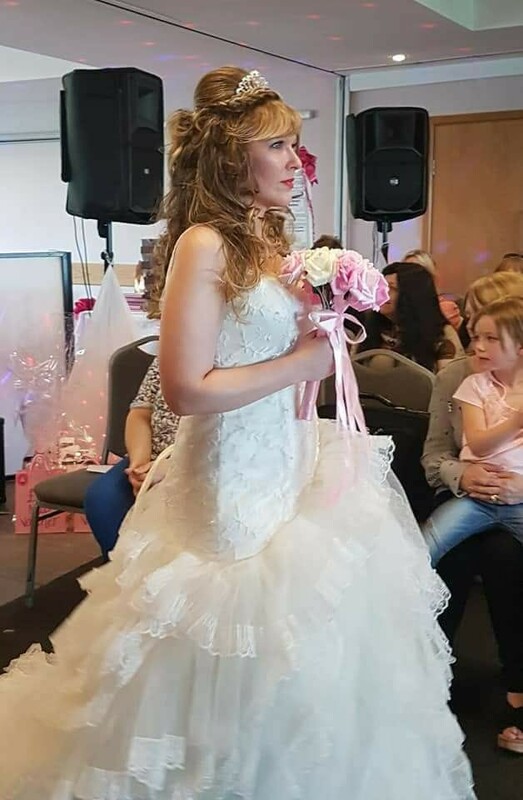 Whether it is a contemporary or an alternative wedding you are looking for these looks can be achieved as shown by our models in the battle of the Brides. 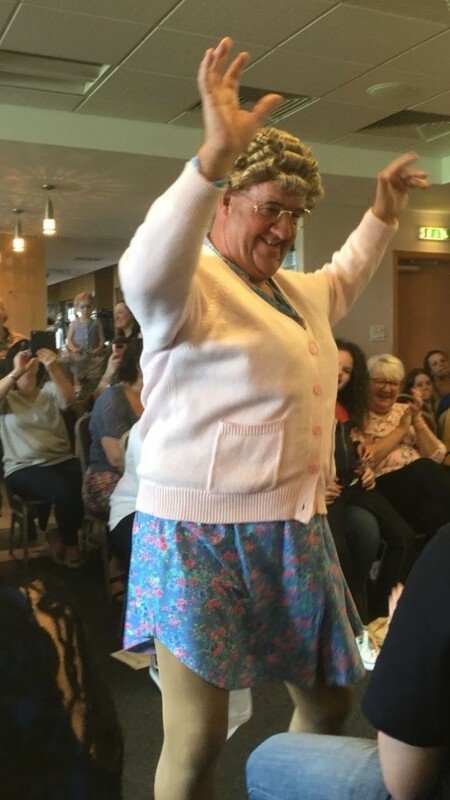 We had a special guest join us all the way from Ireland, Mrs Brown stole the show with her impressive dance moves. Also Michael Jackson made a special appearance to perform a famous dance routine which got all the crowd going. 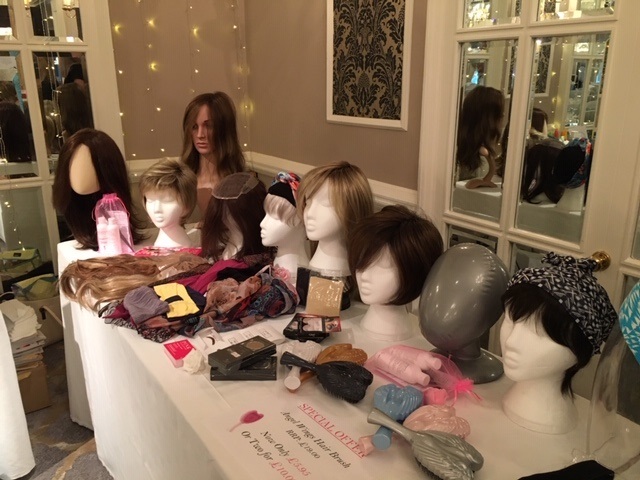 To end the show we presented a full range of everyday wigs so ladies could see they can still achieve their desired style with a wig and be confident , we also showcased a range of headwear and fringes for people who may not want to wear a wig. We would like to say a massive thank you to all the lovely models: Levi, Vicky, Sam, Mia, Kira, Victoria, Sammy, Kate, Tegan and Mrs Brown. And to all the staff at Pink as the day would not have been possible without them. We are delighted to announce the details of our Spring charity event to raise money for Breast Friends. 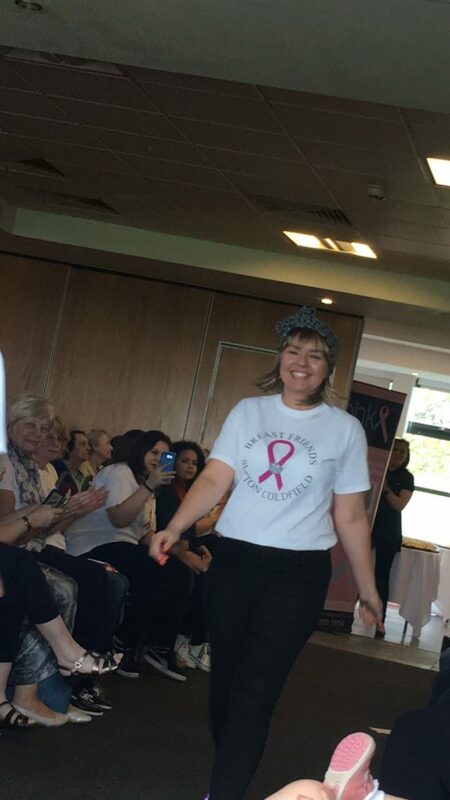 Our event will take place on Sunday 22nd April at The Pavillions on Moor Lane in Birmingham and will be an afternoon packed with fun, fashion and fantastic prizes. 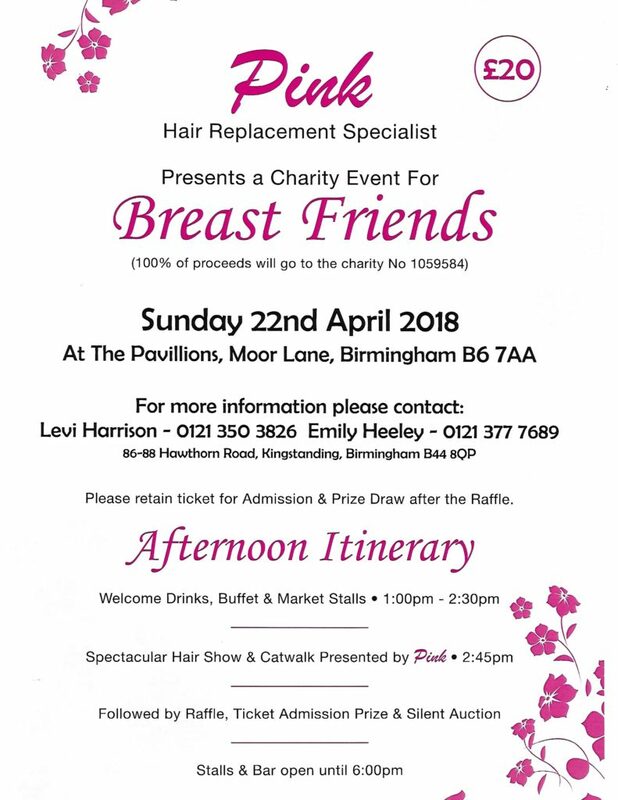 At Pink we are all really looking forward to this fundraiser, where 100% of the proceeds will be given to Breast Friends – the registered breast cancer charity. 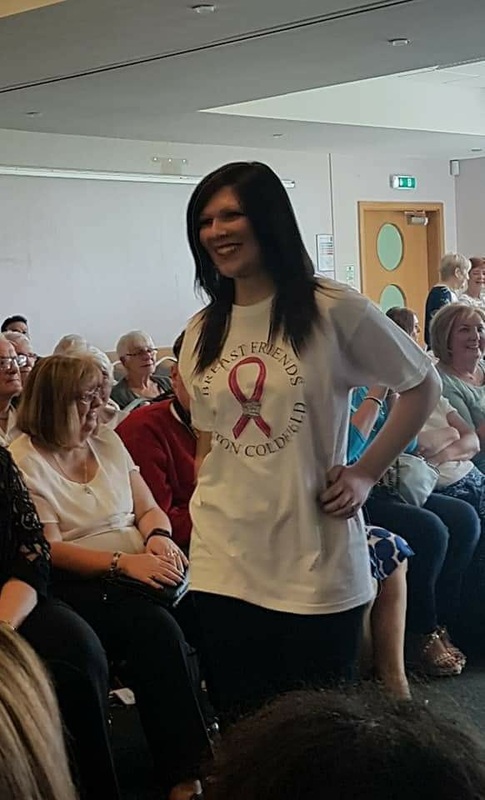 Breast Friends is run wholly by unpaid volunteers, all of whom have been diagnosed with breast cancer, and they provide a fantastic support service to local women through diagnosis, treatment and beyond from their base at Good Hope Hospital in Sutton Coldfield. We feel very proud to be supporting this fantastic charity and through our event we hope to fundraise as much as possible to enable them to continue their vital work. We’d like to invite you to join us for an afternoon of hair, fashion and shopping. You’ll have chance to browse market stalls, enjoy refreshments and watch a spectacular hair and catwalk show. With a raffle, admission prize and silent auction to get involved in too, there are plenty of opportunities to walk away with a prize. Admission is just £20, and the event starts at 1pm with welcome drinks and a buffet. The more people who come along, the more we can fundraise for Breast Friends, so please do spread the word and help us to make this an event to remember. For tickets or more information please call Pink on 0121 350 3826.